Simply add your usual shopping items to your list. Reorder them to match your path through the grocery store. Combine your item with an image from the photo library or directly from your camera to identify the brand and product type you want to have in your cart. Requires iOS 12.1 or later. Compatible with iPhone®, iPod touch® and iPad®. Offers Apple Watch App for iPhone. 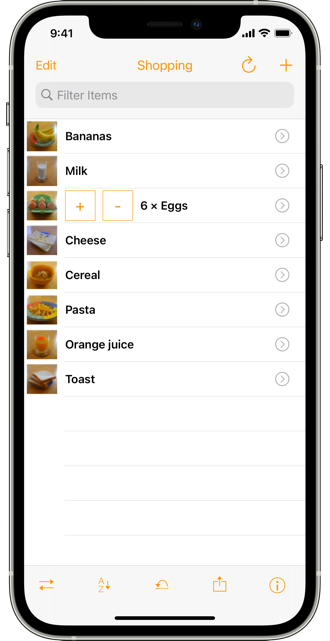 Tap the thumbnail image to quickly edit an item's count. Synchronize the shopping list (text-only) with your Dropbox (https://www.dropbox.com). Tap the Sync button to setup the initial connection to Dropbox. The list will be automatically synced and you can edit the list on other iOS devices or your computer. Share the folder 'on_my_list' within your Dropbox account to allow other users to maintain the list with you. The folder must be shared before the other account owner sets up sync on his device.